I am a cultural arts worker because I, not only, paint, do printmaking, some sculpture, draw, make collage, do public art, but I am also an independent teacher/professor and activist. I lecture, teach printmaking workshops, jury, curate, write and organize exhibitions for the Native community. In my work I use humor and satire to present narratives on ethical treatment of animals, humans and our planet. My work is philosophically centered by my strong traditional Salish beliefs. 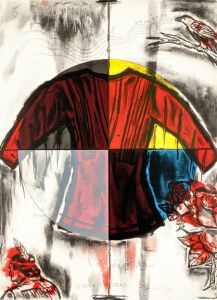 Jaune Quick-to-See Smith was born at the St. Ignatius Indian Mission on her reservation. She is an enrolled Salish member of the Confederated Salish and Kootenai Nation, Montana. She received an Associate of Arts Degree at Olympic College in Bremerton Washington. 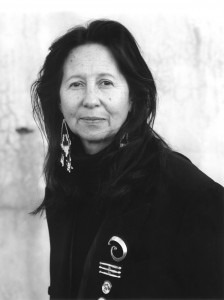 She attended the University of Washington in Seattle, received her BA in Art Education at Framingham State College, MA and a masters degree in art at the University of New Mexico.Jaune Quick-to-See Smith is one of the most acclaimed American Indian artists today. She has been reviewed in most art periodicals.  Smith has had over 100 solo exhibits in the past 40 years and has done printmaking projects nationwide. Over that same time, she has organized and/or curated over 30 Native exhibitions, lectured at more than 200 universities, museums and conferences internationally, most recently at 5 universities in China. Smith has completed several collaborative public art works such as the floor design in the Great Hall of the new Denver Airport; an in-situ sculpture piece in Yerba Buena Park, San Francisco and a mile-long sidewalk history trail in West Seattle and recently, a new terrazzo floor design at the Denver Airport. She is in the collections of the Museum of Modern Art, Quito, Ecuador; the Museum of Mankind, Vienna, Austria; The Walker, Minneapolis, MN; Smithsonian American Art Museum, Washington DC; the Museum of Modern Art, the Brooklyn Museum, the Metropolitan, The Whitney Museum, NY and the Victoria and Albert Museum, London. Jaune Quick-to-See Smith states, “Theatres of War is a phrase used in WWI–I did this during Bush’s reign and Rumsfeld who made war sound like a video game. The bird sings like a machine gun and I used titles of Broadway plays in the ground.